We are frequently asked whether a home comfort, or HVAC, system should be repaired or replaced. The best advice we can provide are recommendations for how to get the most out of an existing or new home air conditioning system. Let’s ask a few questions to better assist your decision-making process. Is the repair or replacement within your budget? What is the warranty period of a repair versus replacement? Repair warranties generally last 30 days to a full year. Most manufacturers now offer a standard 10-year registered parts warranty with new equipment. Our parts department can assist you in providing a quote for service repairs, but we will still need to send a qualified service technician to your home for a complete diagnostic of the air conditioner or heater. While you’re waiting on a repair quote, contact one of our Comfort Specialists to get a ballpark figure for a new air conditioning system. Is the air conditioner properly sized for the current design of your home? In the HVAC industry, size does matter. This is best determined by having a Manual J load calculation performed on your home. The load calculation will determine the required load, or tonnage of air, to adequately heat and cool the building. If you are planning or have already made changes to the energy efficiency of your home (insulation, new roof and/or windows), then we strongly recommend a load calculation during this process. The air conditioner should not be too big nor too small; it needs to be just right for the design of your unique home. Is the home comfort system operating properly in Florida’s humid climate? Bacteria growth is common in Florida’s heat and humid air. The fan setting should never be set to ON due to high humidity in Florida’s climate. It is always recommended to keep the fan setting to AUTO. Is the air conditioner cycling too often making your home damp or uncomfortable? Our qualified service technicians are available 24/7. Is the filter being changed regularly? A standard 1” filter should be replaced every 30-60 days. Larger media filters can last anywhere between 3 months and an entire year. A dirty filter can affect the longevity of your HVAC system. Please make sure you change the filter as recommended to keep your indoor air quality at its best. Is there adequate insulation in the attic? Insulation acts as a barrier to keep the conditioned air within your home. The recommended value for insulation is R-30. Do you know the current R value of your attic insulation? Contact our office to schedule a free in-home estimate or visit this page for more details. Is equipment zoning or dampered zoning the right solution to conserve energy and provide comfort? What’s the difference? 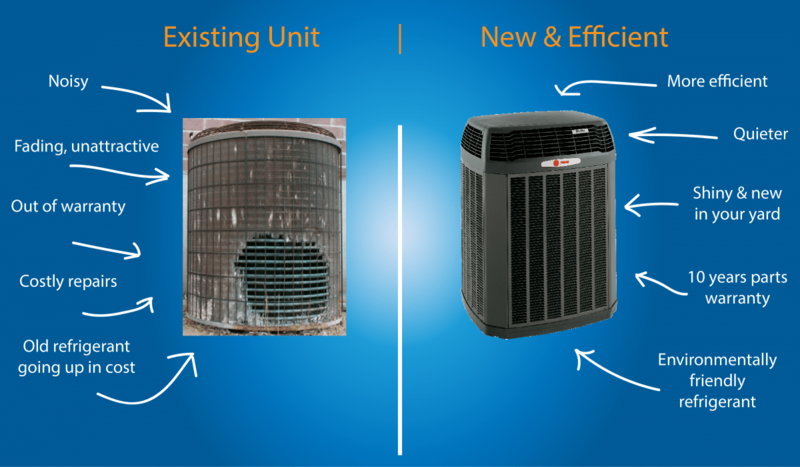 Equipment zoning is when you have multiple air conditioning systems that heat/cool different areas, or zones, of the home. Dampered zoning is when one air conditioning unit is used for the entire home, but there are dampers that open and close to different areas of the home as needed. One centralized thermostat can be installed with dampered zoning to control all areas of the home. Call Bertie Heating & Air Conditioning to receive more information on your decision to repair or replace the air conditioner. We evaluate each scenario differently with your best interest in mind.